The Infiniium MSO8064A provides unmatched acquisition performance with up to 128 Mpts of deep memory mapped to a high-definition display, powered by next-generation MegaZoom technology. See signal details never before uncovered by a traditional digital storage oscilloscope (DSO). 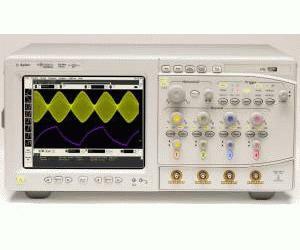 The Agilent Infiniium mixed signal oscilloscopes (MSOs) tightly integrate 4 scope channels and 16 digital channels in the same acquisition system to provide time-correlated viewing and triggering across 20 channels for the best mixed-signal embedded debug tool.